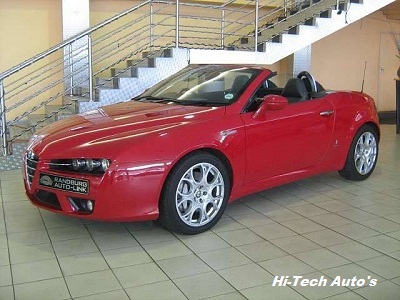 "Alfa Spider 3.2 V6 JTS"
The Alfa Spider is synonymous with freedom, technology and pure Italian style. It’s a legendary open top sports car, heir to the legacy of the Giulietta Spider and the unforgettable Duetto – true icons of the automotive world. The car has a sharp, aggressive look which is decidedly masculine. The Alfa Romeo Spiders quality has an immediate charm where as the ride and handling of the car grows over a period of time. Certainly a car you choose with your heart and not your head. 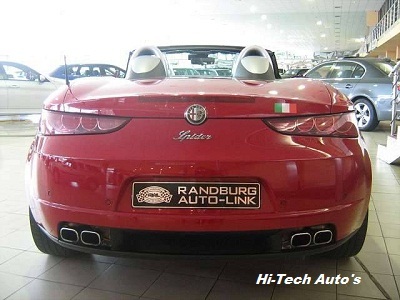 The Alfa Romeo Spider offers outstanding dynamic performance thanks to high double wishbone suspension at the front and Multilink at the rear. 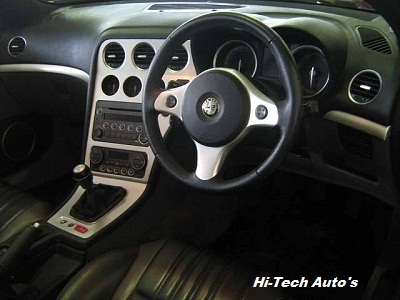 Along with great ride comfort, the Alfa Spider boast a sports suspension configuration and the use of state of the art 'Q4' four wheel drive, which is available on the 260 bhp 3.2 version. 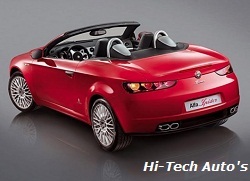 What's more - like the 159 sedan which was recently awarded five prestigious Euro NCAP stars - the Alfa Romeo Spider once more confirms the utmost attention goes into all aspects regarding safety, as well as offering the most sophisticated electronic vehicle dynamic control devices. The Gallardo's mission is to be the highest-performance sports car inside its segment. Do you want to earn a R 1000.00? Refer a colleague, your friend or a family member to Hitech Auto's to purchase a car and on completion of the transaction you will be paid a full R 1000.00. When I decided to buy another vehicle, I looked around and found what I wanted and then, I talked to Dillon at Hi-tech Cars. 32 Page Guide to Understanding your Rights. If you want to sell your car to us this is the place meant for you. 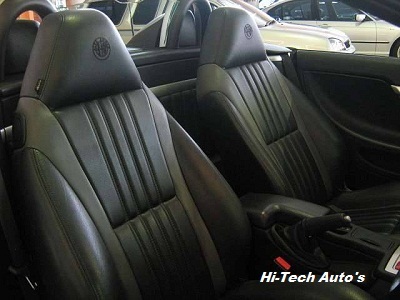 We purchase almost any make and model depending on condition and obviously market price.